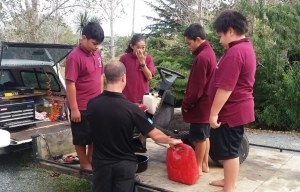 Lincoln Carr has kindly agreed to share his mechanical expertise with a group of budding engineers at Oruaiti School. Joe, Jacob, Ngakau and Noa really enjoyed getting the ride-on lawnmower working again! Ka pai! Nice work boys! Looks like fun.